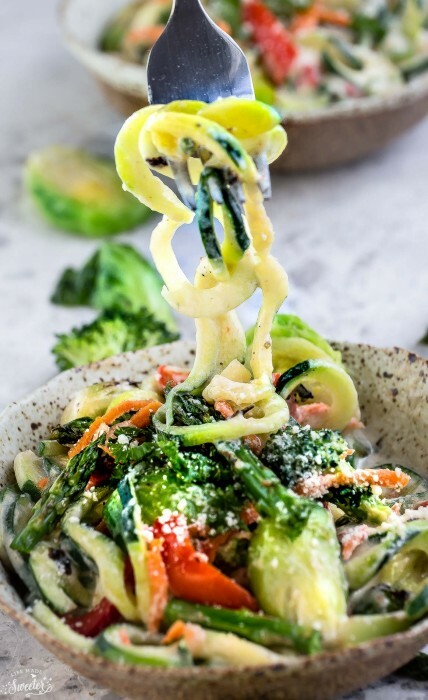 This healthy one pot Cauliflower Alfredo Zoodles is made with zucchini noodles and packed with spring vegetables including asparagus, broccoli, Brussels sprouts, red bell pepper slices and shredded carrots. It’s coated with a creamy vegan vegetable sauce that is paleo, Whole30, gluten free, low carb and dairy free. ……and Fettuccine Alfredo was next on our list. This vegan version starts off with the popular creamy cauliflower sauce you’ve most likely seen all over the internet. If you haven’t tried it yet, you totally should! It really is amazing how creamy it gets with a high-speed blender. 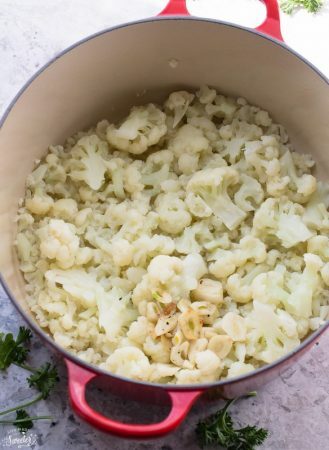 The cauliflower florets get tossed into a big ‘ole pot until they cook up nice and tender. Next, into the blender they go where they get transformed into a super smooth and creamy sauce. I added roasted garlic, smoked paprika, cayenne pepper and a pinch of key lime juice to give it a refreshing zing and a bump of flavor. I also swapped in nutritional yeast to keep it completely vegan but you can totally use Parmesan cheese if you prefer. The best part about this dish is you can add whatever veggies you have on hand. I used asparagus and broccoli this time. I also couldn’t resist adding Brussels sprouts, cherry tomatoes, a bell pepper and some shredded carrots. I didn’t add any additional protein since this was packed with so many veggies and the cauliflower sauce itself is pretty filling but you can easily add tofu, chickpeas or anything else you like. 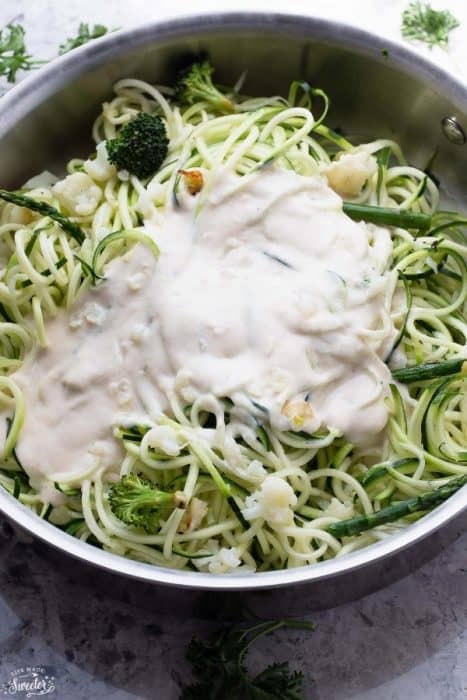 These Cauliflower Alfredo Zoodles make a healthy, low carb, low sugar meal and are a great way to clean out your fridge with any lingering vegetables. 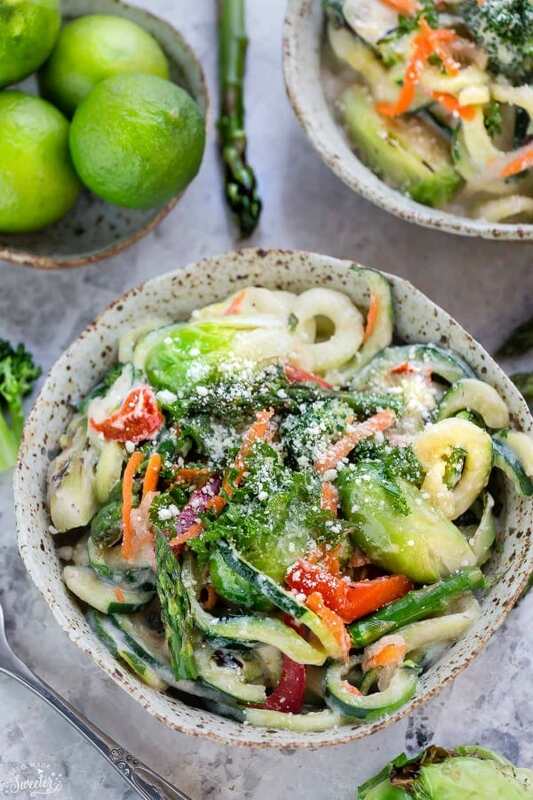 This healthy one pot Cauliflower Alfredo Zoodles is made with zucchini noodles and packed with spring vegetables including asparagus, broccoli, Brussels sprouts, red bell pepper slices and shredded carrots. It's coated with a creamy vegan vegetable sauce that is paleo, Whole30, gluten free, low carb and dairy free. Spiralize zucchini using the ribbon blade, mandoline or a vegetable peeler; set aside. Pat dry with a paper towel. Place cauliflower florets in a large pot over medium-high heat and cover with water. Bring to a low boil then lower heat to medium and cook for another 6-8 minutes, or until fork tender. 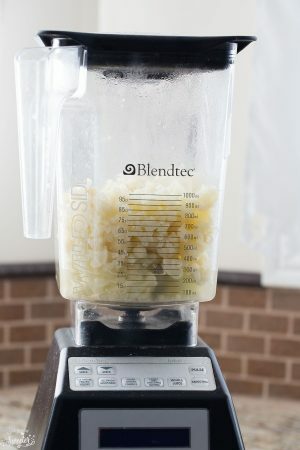 Using a slotted spoon, transfer cauliflower to a blender. Add roasted garlic, smoked paprika and nutritional yeast and blend. Add 2-3 tablespoons reserved cooking liquid, and continue to blend until smooth. Add more water as needed to thin out sauce while blending. Season with salt, black pepper, and cayenne pepper, if desired. Heat olive oil in a large skillet over medium heat. Add garlic and cook for 30 seconds, or until fragrant. Add asparagus and other vegetables and saute for 3-4 minutes, until tender. Add zucchini noodles and cook for 1-2 minutes until just softened - do NOT overcook. Add the sauce in the skillet and mix well to coat. Season to taste and sprinkle with parsley and nutritional yeast, if desired. Serve immediately. *For a non-vegan option, use Parmesan cheese instead. Everything looks amazing, healthy & light. I can’t wait to try the recipes. 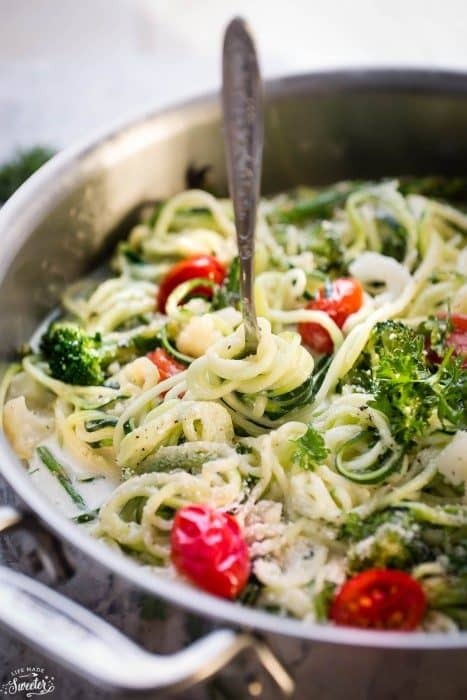 This bowl of zoodles is so healthy and looks super delicious! I am totally loving the creaminess and how it’s made in the blender 🙂 Pinning! Loving the spring vibes! So colorful! 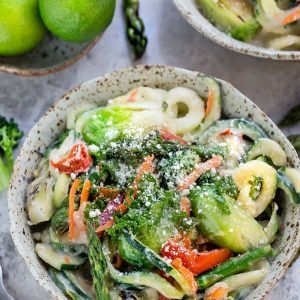 I am loving how creative everyone is getting with zoodles at the moment. A healthier comfort food, which sounds good to me! Everything about this recipe seems like ultimate perfection! Love how it’s super healthy and also, how it’s dairy free. One of my good friends is lactose intolerant, so I try to search for recipes to cater to that for when she comes over for dinner. This is such a pretty dish, Kelly! I bought a spiralizer a few months ago, but have yet to use it! I definitely need to change that after seeing this recipe. I love that you made a healthier alfredo! Yum! This looks so healthy and amazing, Kelly! Yay for Zoodles AND for cauliflower alfredo sauce! I love both, but I have never thought of combining the two! Genius, Kelly! So healthy and seriously delicious! LOVE that you packed with full of veggies! Totally craving a big ole bowl of this right about now! Pinned! Cheers, dear! Thanks for this amazing recipe, Kelly! I haven’t tried making cauliflower alfredo, but I have to imagine I’d love it much more since I’m not into totally rich food! These noodle bowls are beautiful with all those colors and veggie goodness, Kelly! So springy and delicious! A great recipe, Kelly. These zoodles sound fantastic! I just stocked up on nutritional yeast over the weekend … now I need to put it to use with this! I’ve made alfredo from cauliflower once before, but I can’t wait to try it again with this yummy recipe! This bowl of zoodles sounds so delicious and springy. I just love cauliflower alfarado 🙂 Thanks for this awesome recipe, Kelly! Pinning! Love this spring inspired zoodle dish! Cauliflower alfredo sounds amazing! It’s still winter here in Winnipeg…we are constantly being teased by nice weather only for it to snow again! Love all the colour in this dish! Kelly, I adore your photos – they make me wanna reach into the screen and grab a bowl and fork! And, I love a healthier, veggie packed sauce and that Roasted Garlic Cauliflower Alfredo Sauce sounds wonderful. Love how colorful and flavorful this dish is! I need to add it to our menu soon! This is such a beautiful Spring dinner Kelly! ONE DAY I will finally get a spiralizer and I can try all of these fun recipes! So delicious and healthy! The sauce looks so creamy despite having no dairy! 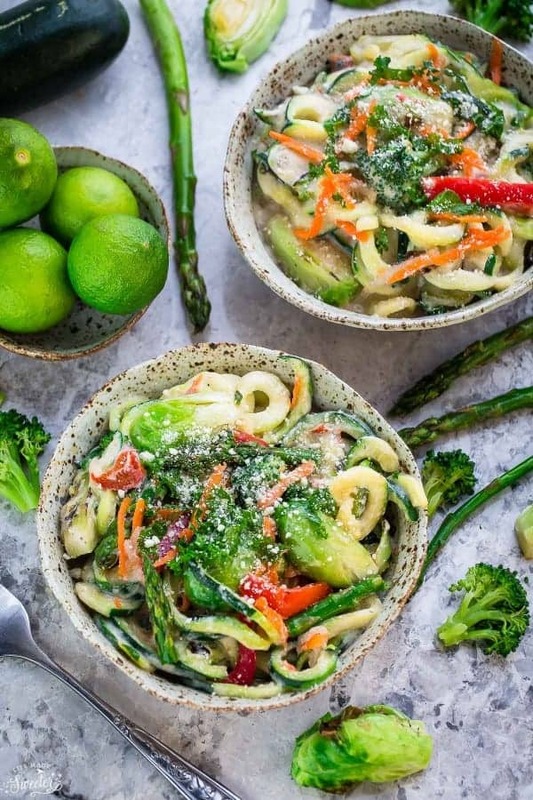 This is just the kind of healthy zucchini noodle bowl I want to dive into! LOVE! I am craving alfredo, but since I’m not eating dairy right now I can’t have it. But now I can! Can’t wait to make this! So comforting, but so healthy. Great recipe Kelly! What a perfect way to start spring, with all these colourful veggies. Winter is starting to go away here in Scotland its been lovely and sunny recently but they have predicted snow for the coming weekend so it looks like Winter hasn’t fully gone yet!